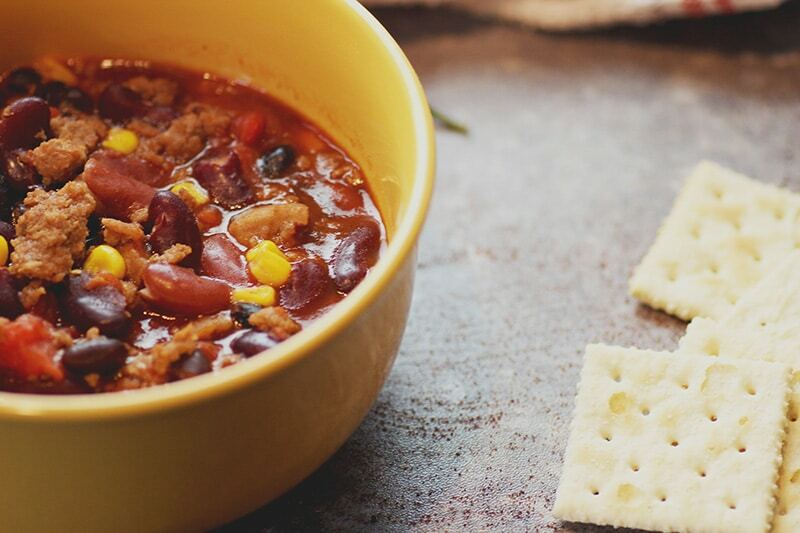 Turkey Chilli is one of those meals you love to have on a nice brisk fall or winter day. And I thought I left the cold and frigid temperatures of the Midwest. But oh contraire, mother nature is not letting me forget where I come from. I remember our first “snow storm” here in North Carolina. We had started hearing early the week before that we were supposed to get some snow when the weekend arrived. We didn't realize how serious it was for North Carolinians that snow was coming. Not until we attempted to hit the store that Thursday. We decided to run during the week in lieu of our normal Saturday grocery trip. Just in case we were “snowed in”. When we pulled up to the grocery store we were amazed to see that everybody and their mother and mother's cousin was there. You would have thought we wouldn't have access to bread and milk for weeks. The way these people were piled in the store was unreal. No lie, the lines at Walmart were legit longer than any time I had been in there during the Christmas season. While I didn't let my anxiety win. I have to say it was quite the grocery trip for a midday run. I mean did everyone leave work to go grocery shopping?? Friday came and the hail started and we were lucky to be able to entertain “Fast Food Friday”. Places were closing early left and right. Once we got settled the snow started to lightly fall. We woke up Saturday to people sledding in the streets. It was ha-larious. Here we are used to 7+ inches of snow and frigid temperatures for 7-9 months out of the year. And we were now “snowed in” with a mere 2 inches of snow. Sunday the snow-covered ground turned to ice. It continued to be a winter wonderland. We got the call that school was even going to be closed come Monday. While Turkey Chilli was on the menu for the week, I figured what better day than that frigid southern snow in. I make my chili on the stovetop. 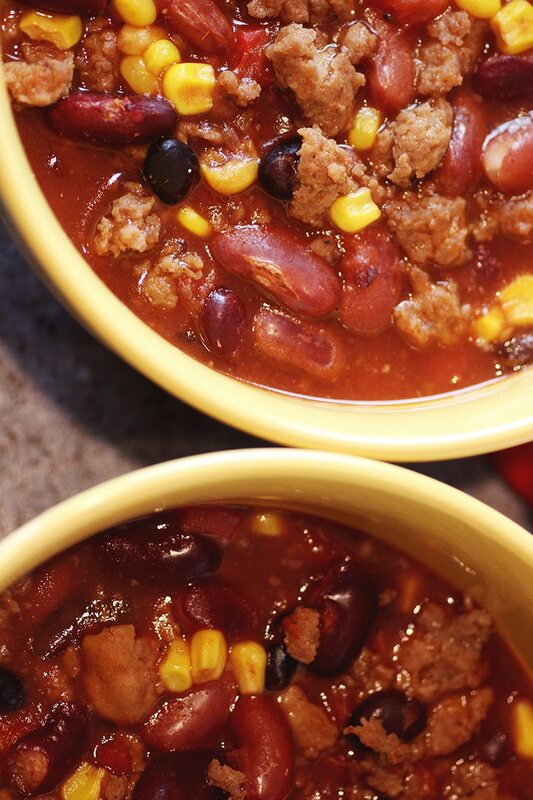 This simple and easy stove top turkey chili recipe is perfect for the cool days up north or in the south. So I went to the pantry and rounded up my supplies and hit the stove. This year has been even more of a doozy than last, in terms of snow. The kids have had like 4-5 days off in the last month or so already. And because the schools here don't buffer for snow days, they are scheduling makeup days into spring break and even one extends the school year. Some things remain the same though. 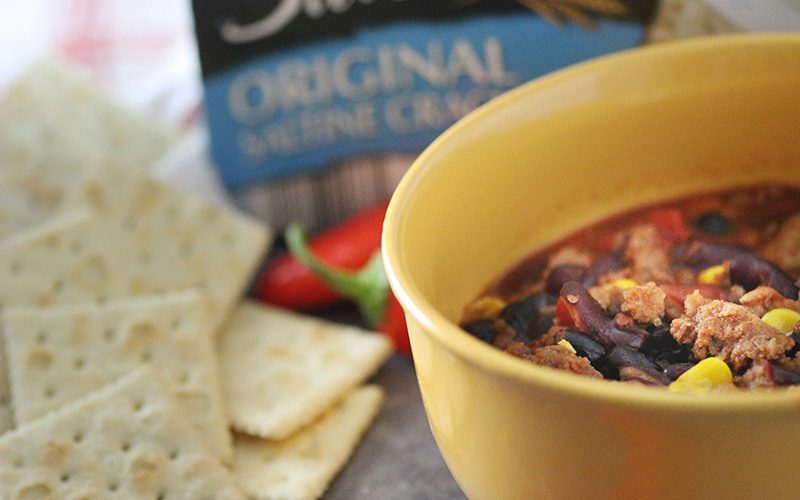 Chilli is always a staple meal in these months. And while it has warmed up a little recently, it is still cold enough to put a nice hot bowl of Turkey Chilli on the table. My family is a no beef and no pork bunch of folks. 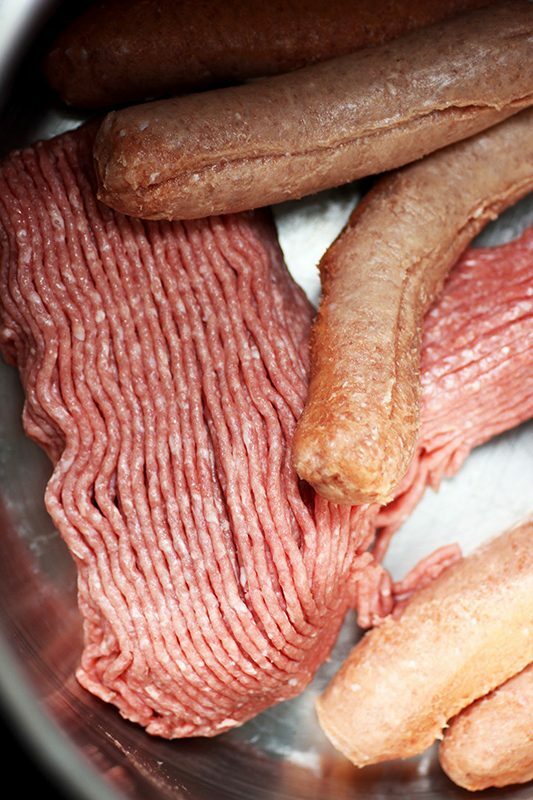 Therefore, any recipes that would call for ground beef are usually made with ground turkey, turkey Italian sausage or a combination of both. For turkey chili, I use both. 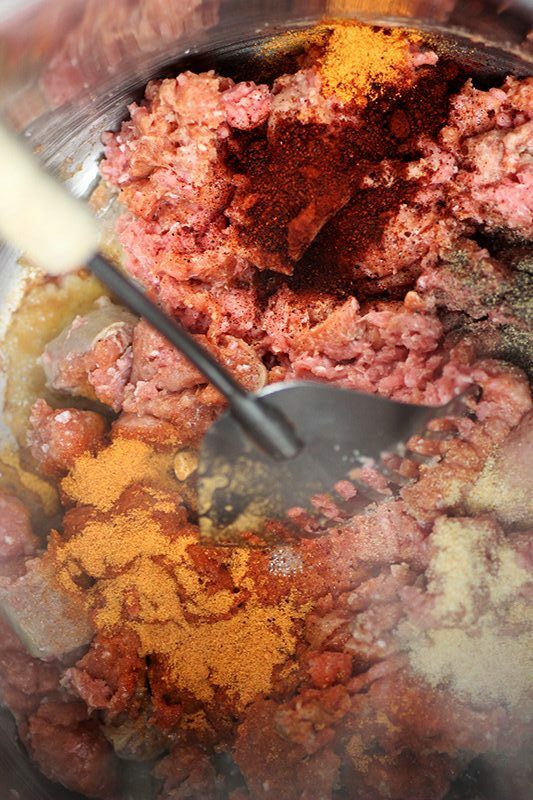 I have found that the trick to using ground turkey is ensuring that you season it properly. And folks who don't know how to do that, swear ground turkey is the pits. Until you eat at my house! My chili recipe is one with a little punch. Just enough to make the old man's head bead up in sweat. With a little bit of sweet to offset it. 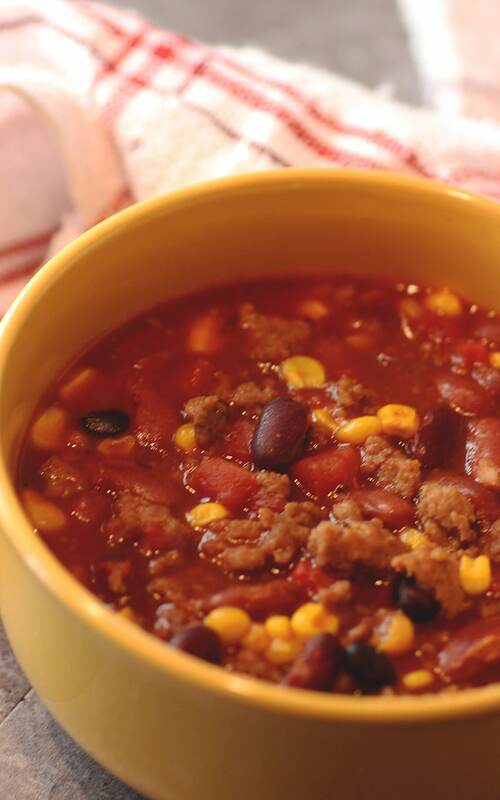 Next time you are snowed in, or just need a quick meal to make on the fly, I offer you up the recipe to my Simple and Easy Turkey Chili. A quick easy chilli for those who love a healthier, lighter option or don't eat beef and pork. Put ground turkey in large pot. Cut the skin off the individual Italian turkey links and place them in pot. And cook meat over meadium high heat. Once meat is brown with minimal to no juice left start pouring in tomatoes, beans, and corn. Add can of tomato sauce and paste and stir well. Decrease hit to med-low and let simmer stirring occasionally. For about twenty minutes. Once it appears to start thickening, add siracha and sugar. Stir well. Let simmer for 10-15 more minutes and remove from heat. Serve warm with rolls or saltine crackers.The four seasonings listed are what I use. It is suggested that you season your meat to your liking and taste preferences. You go girl! I do not eat chili…nope! Can’t do it but it looks like you did that!! 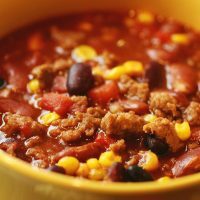 Chili is a favorite in my home during the fall and winter. Lol at yall getting two inches of snow and the town coming to a halt. We got a dusting on Saturday and that was about it. It didn’t last and so we are waiting for our first blizzard of the year. Yea this was so new to me. In cleveland life went on unless it was extreme circumstances. This looks so good! I need to try this recipe. Chili is so yummy! I will definitely be trying this. Yummy! I put fire roasted tomatoes in my chili the other day and I loved it. I never thought to add Italian sausage, the flavor has to be amazing! I LOVE CHILI!!! This is definitely something I cook all the time. I out mine in the crockpot int he morning. Girl, ALDI is my jam. This looks exactly like the Chili I make with ground turkey. Great minds think alike! people be sleeping on Aldi!! I love them.